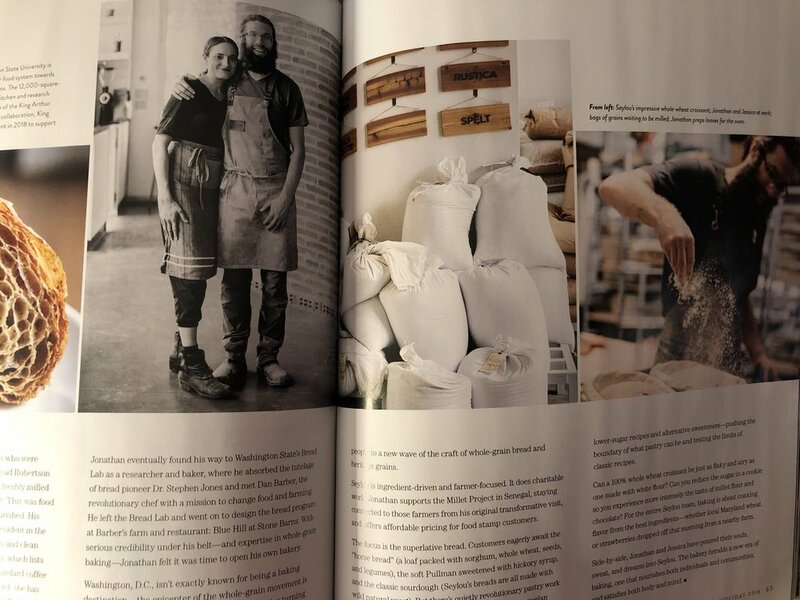 Since 2015, the flour company, King Arthur Flour which is based in Vermont, has been producing a magazine called Sift and selling it from the shelves of grocery stores, book stores and shopping clubs including Sams, Walmart, Giant Eagle, Meyers, Stop-n-Shop, and many others. The magazine is published in a velvet finish with thick pages - quite a luxury read - and features 75 recipes produced mainly by its food editor (who is also a chef), Susan Reid, and feature stories usually produced by its Managing Editor, Posie Brien. Sift is only sold in stores and is not available for subscription. Specialty magazines like this are on the rise, and it’s triggering our impulse to collect. When traditional magazines from publishers like Conde Naste and Meredith are announcing the ceasing of print publications, what are new niche magazines like Sift thinking? Here’s what they know: the power of paper, branding, reach, and the reading experience. 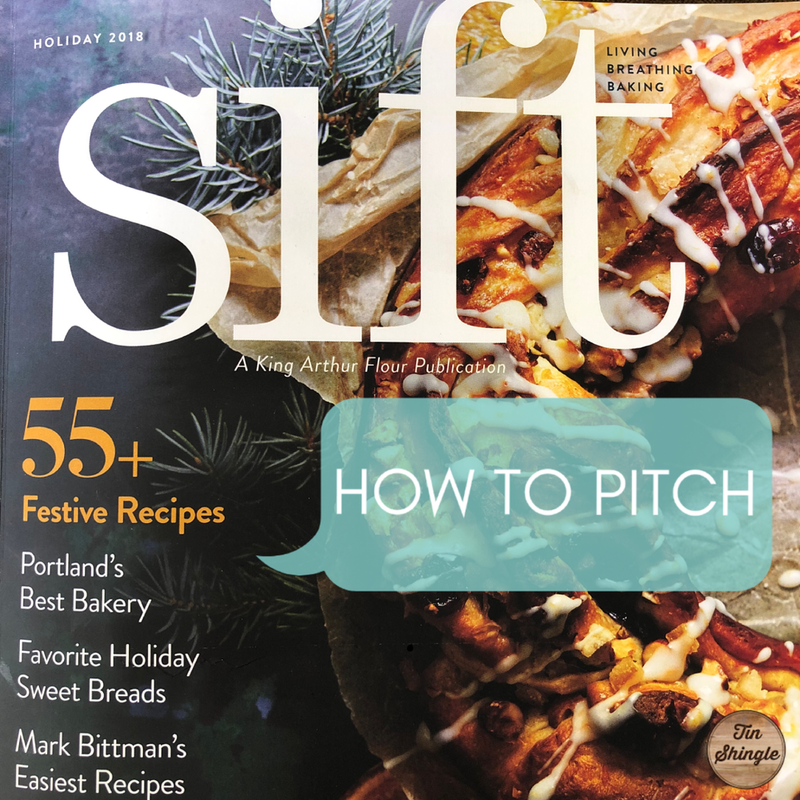 While the chance for being featured in Sift is small, the feature would carry that much more weight, since one respected brand is recommending another in their publication. Susan gave us some insight into what they look to feature in the magazine. Before you pitch, remember why Sift was started: to educate bakers of all levels about flour - specifically King Arthur Flour. There are other people and products outside of King Arthur Flour’s brand who make it into the pages of Sift, but qualifying is tight. People do pitch the magazine, but according to Susan, 80% of the pitches are off-base and not a fit. In order to pitch Sift, the idea needs to be about flour, King Arthur Flour, and fit within the high quality standards of a B Corporation. Q: I must admit - I never gave second thought to what flour I bought, and didn’t know how to tell the difference between any of them. Until I got Sift Magazine. A: Flour is the backbone of any baking recipe, and it can vary much more than people are aware of. That’s one of the reasons we’ve redesigned our flour bags to feature each flour’s protein content, and launched the flour IQ campaign, because you are not alone! Flour is very frequently taken for granted, and using a flour that isn’t consistent not only causes problems but creates confusion. Bakers who get sub-optimal results often don’t know that the flour could be an issue. Q: Does Sift feature products from other companies in the magazine? A: It depends. Our focus is on companies we that meet our standards (we’re a registered B corporation) and baker’s needs. We work with American Pans, NordicWare, and lots of cool Vermont producers. Q: How long do you work on each issue? What is your lead time for an Editorial Calendar? A: The issues overlap; we just sent Spring 2019 to the printer [as of March 2019]; we are in the middle of booking/executing photography for Fall, and are finalizing content for Holiday and starting to test recipes for that. I’d say each issue, start to finish, is about 6 months. We are about 9 months ahead of our drop dates. There are 3 issues per year: Spring, Fall, Holiday. The magazine always drops on the last Tuesday of the month they come out. March for Spring, August for Fall, October for Holiday. Q: How do you get your leads on people to feature, like artisan bakers or bakeries? Can people pitch you? A: Many of the bakeries we feature are ones that use/buy a lot of our flour; our Bakery Foodservice division sells as much or more flour as we do in grocery stores. We do look at pitches, but find that 80% of them haven’t taken the time to understand what our regular features are, what we’ve already published, or considered that our primary function is to encourage and inspire baking that uses our flour. We keep an eye out for new book titles in the pipeline, and have worked with some authors to pick up some of their content and photography if they’ll also give us 2 exclusive recipes for the magazine. Pitch Sift if you use King Arthur Flour and have a story to tell. You might not need to know what season the magazine is working on at the moment, but you could check for Sift in Tin Shingle’s Editorial Calendar Collection to know if you want to put a Holiday or Spring angle on your pitch. Otherwise, this type of a pitch on a person or cafe will be seasonless, but you’ll want to be sure it includes the use of King Arthur Flour. Featured in Sift’s 2018 Holiday issue are Jonathan Bethony and Jessica Azeez. Jonathan attended The Bread Lab at Washington State University, of which King Arthur Flour is a supporter with their substantial endowment to the Bread Lab to help it continue for years. Most of the products recommended in Sift are from King Arthur Flour, but not all. Some books and products are from outside brands. To qualify for editorial consideration, King Arthur Flour is a Certified B Corporation, which means they need to meet high quality standards for being a good corporate citizen before recommending it. Include why your brand would fit this requirement in your pitch. The products will need to have to do with baking. If you’re an author of an expert, you do have a chance that the editors may want to work with you. If you design recipes, Sift is going to want to use 2 of them, exclusively. Stay on point, and remember, your pitch will have to do with baking. How To Pitch Sift - Who To Pitch? Both Susan and Posie are in Tin Shingle’s Media Contact Library for your to find their social handles, portfolios and other relevant information for pitching them. Posie also writes for her blog at PosieHarwood.com, and has the most incredible food photos and recipes. She has also written for other major food magazines including Tasting Table, Food52, and Bon Appetit. You would discover both of these editors in Tin Shingle’s Media Contact Library if you were looking for writers or editors who we have identified with Areas of Interests like Food, Recipes, Baking, Gift Guide, and others. Join Tin Shingle today for access to our Media Contact Library to find gems like this publication and its editors. Tin Shingle has also added Sift’s publication cycle to our Editorial Calendar Collection, so that you can always know where the editors’ are in their headspace, should you want to pitch the magazine with a seasonal angle. For instance, it’s great to know that in March, the editors are already working on their Holiday recipes and recommendations. Tin Shingle’s Editorial Calendar collection will keep you in tune with timely insight like this.